Advance Purchase Deal : Up To 35% Discount!! Advance Purchase Deal : Up To 35% Discount at Per Aquum Huvafen Fushi, Maldives. Book in advance and save up to 35% for stays of one night or more at Per Aquum Huvafen Fushi, Maldives. Promotion includes: Up to 35% saving on stays of one night or more. Daily breakfast in Celsius. 25% saving when booking 15 days in advance. 30% saving when booking 30 days in advance. 35% saving when booking 60 days in advance. Terms & Conditions: Valid for booking and stays until 31st October, 2016. Get 25% Discount On Accommodation In Villa Layali Desert Palm Hotels, Dubai!! Get 25% Discount On Accommodation In Villa Layali Desert Palm Per Aquum Hotels, Dubai. Hide away in a three bedroom villa that takes Arabian luxury into imaginative new territory. Enjoy an exclusive 25% off introductory promotion on your stay at Villa Layali Desert Palm Per Aquum Hotels, Dubai. Promotion includes: 25% discount on accommodation in Villa Layali. Daily breakfast. Late check out until 6:00 pm, subject to availability upon departure. Terms & Conditions: Valid for bookings until 30th September, 2016. Stay Longer Special : Up To 15% Discount!! Stay Longer Special : Up To 15% Discount On Accomodation At Desert Palm Per Aquum, Dubai. Per Aquum�s Stay Longer specials gift you with bold discounts when you lavish yourself with more days of surreal luxury. Save up to 15%. Promotion includes: Stay three to four nights and receive a 10% discount on accommodation with daily breakfast. Stay five nights or more and receive a 15% discount on accommodation with daily breakfast. Terms & Conditions: Valid for booking and stays until 30th September, 2016. Two Nights Accommodation With Daily Breakfast!! Two Nights Accommodation With Daily Breakfast Per Aquum Desert Palm Signature. Luxury escapes of 2 nights or more come with a daily breakfast and cocktail, 20% spa discount, room upgrade and late check out at PER AQUUM Desert Palm Signature Escapes. Promotion includes: Two nights� accommodation or more. Daily breakfast. One sundowner per person per stay. Upgrade to the next room category*, subject to availability upon arrival. Late check out until 4:00 pm, subject to availability upon departure. One 60 minute Intuitive Massage for two per stay. T&C: Valid until 31 December 2016. Subject to availability, seasonal variations and change without notice. Minimum two night consecutive stay required. Enjoy Up To 35% Discount On Your Stay!! Enjoy Up To 35% Discount On Your Stay At Per Aquum Niyama, Maldives. Escape to PER AQUUM Niyama and enjoy up to 35% discount on your stay at Natures Playground. Promotion includes: Up to 35% discount on accommodation. Daily breakfast in Epicure. T&C: Black out date applies from 15 December to 15 January. Offer valid until 19 December 2016. 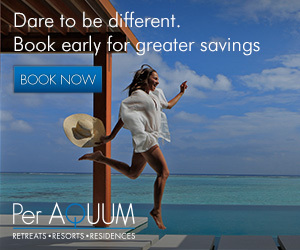 Book In Advance And Save Up To 35% For Stays Of One Night Or More PER AQUUM Hotels, Maldives. Book in advance enjoy up to 35% discount. Renowned for its trailblazing concepts PER AQUUM Huvafen Fushi is one of the Maldives most iconic properties and is PER AQUUM�s original retreat. Promotion includes: Up to 35% saving on stays of one night or more. Daily breakfast in Celsius. Additional info: 25% saving when booking 15 days in advance. 30% saving when booking 30 days in advance. 35% saving when booking 60 days in advance. T&C: Offer valid until 31st March 2016. Subject to availability, seasonal variations and change without notice. Minimum four night consecutive stay required. Reservations must be made at least 15 days in advance. Get Up To 25% Discount on Stay Longer Special Deal in Per Aquum Huvafen Fushi, Maldives. Get Up To 25% Discount on Stay Longer Special Deal in Per Aquum Huvafen Fushi, Maldives. Get the upper hand on your urges. Take advantage of the 2015 Stay Longer Offers and seize those extra days, while slicing away at the rate. Promotion includes: 20% discount on four to six night stay with daily breakfast. 25% discount on seven night stay or more with daily breakfast. One 60 minute spa treatment for two people per stay. T&C: Booking period: until 25th August 2015. Stay period: until 31st August 2015. Minimum four or seven night stay required to receive the respective 20% and 25% discount benefit. Flight details must be provided at least 48 hours in advance for speedboat transfer arrangements to be made. Book Now. Stay Longer Special: Get Up To 20% Discount on Five Night Stay Per Aquum Desert Palm, Dubai. Stay Longer Special: Get Up To 20% Discount on Five Night Stay Per Aquum Desert Palm, Dubai. You know that familiar holiday feeling� Your vacation is on its last day and holiday seduction whispers in your ear, breath hot and sultry, �You wish you could stay just a few more days...� Get the upper hand on your urges. Take advantage of the 2015 Stay Longer Offers and seize those extra days � while slicing away at the rate. Promotion includes: 15% discount on four night stay with daily breakfast. 20% discount on five night stay or more with daily breakfast. One 60 minute spa treatment for two people per stay. T&C: Booking period: until 25th August 2015. Stay period: until 31st August 2015. Minimum four or five night stay required to receive the respective 20% and 25% discount benefit. Offers cannot be used in conjunction with any other offers, discounts or packages and are non exchangeable, non transferable and not redeemable. Book Now. Get Up To 30% Off on Stay Longer : Per Aquum Hotels, Niyama, Maldives. Get Up To 30% Off on Stay Longer : Per Aquum Hotels, Niyama, Maldives. You know that familiar holiday feeling� Your vacation is on its last day and holiday seduction whispers in your ear, breath hot and sultry, �You wish you could stay just a few more days...� Get the upper hand on your urges. Take advantage of the 2015 Stay Longer Offers and seize those extra days � while slicing away at the rate. Offer includes: 15% discount on three night stay with daily breakfast. 20% discount on four to six night stay with daily breakfast. 25% discount on seven to nine night stay with daily breakfast. 30% discount on 10 night stay or more with daily breakfast. One 60 minute spa treatment for two people per stay. T&C: Booking period: until 25th August 2015. Stay period: until 31st August 2015. Rates start from USD 567 per room per night. Offers cannot be used in conjunction with any other offers, discounts or packages. Book Now. Honeymoon Indulgence Huvafen Fushi! Make your honeymoon an out of the ordinary statement with a four night or more stay at Huvafen Fushi. Arrive in style to a chilled bottle of Champagne. Excite and relax the senses in the wonder of the underwater LIME Spa with a couples fluidity massage. Celebrate love and marriage, and feel special with an intimate evening in a private dining world with a honeymoon destination dinner of your choice on the island. Dine under the stars, by the ocean or in a special location wherever you like. Set sail on a sunset cruise for two on board the resort�s Dream Dhoni Maldivian sailboat, for the ultimate romantic adventure. Promotion includes: Honeymoon destination dinner of your choice on the island one evening during your stay. Underwater couples fluidity massage at LIME Spa. Private sunset cruise on board our Dream Dhoni for two. Bottle of Champagne on arrival. Daily breakfast in Celsius. Valid from now until 31 December 2015. Rates start from USD 1,482 per room per night. Book Now. Healthy Holistic Luxury Huvafenfushi! Indulge in the luxury of being healthy with a revitalising four night stay at Huvafen Fushi with daily breakfast in the cool interior of Celsius restaurant, with views of nature all around. Relax in the world�s only underwater treatment rooms at LIME Spa for a refreshing Miracle Ice Facial as you look out to the aquatic landscape under the Indian Ocean. Stretch out in a holistic private yoga session for two to completely unwind and experience energising relaxation. Health spa cuisine is served in Raw for a lunch for two that nourishes with a real vitamin boost to the whole body. Promotion includes: Miracle Ice Facial in the underwater spa treatment room at LIME. One hour private yoga session for two people. Lunch in Raw for two people. Daily breakfast in Celsius. Valid from now until 31 Dec 2015. Rates start from USD 1,230 per room per night. Book Now. Never Ordinary With Advance Savings! Never Ordinary With Advance Savings! Per AQUUM trendsetters are once again ahead of the curve. Those who know what they want and can book 7 days in advance enjoy a 10% saving on stays of one night or more. Located on a 160 acre private polo estate Desert Palm offers a refreshing alternative to Dubai. The advance rates include daily breakfast and offer greater savings, providing you with more opportunity to explore the spa, design and cuisine of the property. Experience the naturally modern elements of the destination with dinner under the stars, a tailored massage in LIME Spa followed by afternoon tea, an exhilarating polo match or a day by the pool with a good book. Promotion includes: 10% saving on stays of one night or more. Daily breakfast in Epicure. Book Now. Extraordinary Maldives Getaway : Up to 25% Discount! Extraordinary Maldives Getaway : Up to 25% Discount! Retreat to NIYAMA, Per AQUUM�s naturally modern, chic resort. Beachside escapes are rewarded with a 25% discount on flexible with breakfast rate. Stay in spacious Studios or stunning overwater and beachside Pavilions with private pools, a fridge stocked with gourmet treats at your finger tips. Come out of your shell at LIME Spa where indulgent and innovative treatments tempt you day and night. Enhance your stay with additional ways to dine in surreal ways; a floating restaurant Edge, an outdoor Tribal grill, and the world's first underwater music club, Subsix. Promotion includes: 25% discount on best available rate. Daily Breakfast in Epicure. Valid from now until 31 December 2015. Rates start from USD 608 per room per night. Book Now. LIME Spa Indulgence NIYAMA!! Stay for three nights or more in spacious luxury in our stylish Studios and Pavilions where sophistication comes easy. Laze on your own private sundeck. Dine when you like with your own deli-stocked fridge of gourmet goodies or enjoy dining over the water. Relax with a sauna and steam at SubLIME before sinking into a complimentary full hour couple�s massage at LIME Spa with its iconic garden and overwater treatment rooms. Feeling refreshed, enjoy a one hour personal training session, a private yoga session and a daily juice from The Deli and daily yoga. Promotion includes: Three nights accommodation. One personal training session per person (one hour). Daily juice of the day from The Deli per person. One Hour couples massage at LIME Spa (60 minutes). One private yoga session per couple (60 minutes). Valid from now until 31 Dec 2015. Rates start from USD 964 per room per night. Book Now. Never Ordinary With Advance Savings NIYAMA! Never Ordinary With Advance Savings NIYAMA! Per AQUUM trendsetters are once again ahead of the curve. Those who know what they want and can book 30 days in advance enjoy a 30% saving on stays of one night or more. NIYAMA offers a range of family friendly activities coupled with the white sand beaches and crystal clear waters ensuring guests can indulge in as little or as much as they want. The advance rates include daily breakfast and offer greater savings, providing you with more opportunity to explore the spa, design and cuisine of the property. Experience the naturally modern elements of the destination with dinner under the stars, a tailored massage in LIME Spa, family activities in the games simulator room or a day by the pool with a good book. Promotion includes: 30% saving on stays of one night or more. Daily breakfast in Epicure. Rates start from USD 608 per room per night. Book Now. Passionate Maldives : 15% Discount!! Passionate Maldives : 15% Discount!! White sands. Blue waters. Luxury lifestyles. Experience the waking dream of Huvafen Fushi, one of the Maldives most iconic retreats. Stay four nights or more and be rewarded with a 15% discount on the best available rate, with breakfast included. Spacious beach and overwater Bungalows have private pools and decks. Pavilions redefine living spaces while CUBE and the floating Dhonis are unique. Indulge in LIME Spa, the world's first underwater spa. Dine at underground wine cellar Vinum; chilled overwater lounge Raw; offshore seafood restaurant Salt; and in the beachside chic of Celsius. Promotion includes: 15% discount on best available rate. Daily Breakfast in Celsius. Book Now. Get 20% Saving on Stays of 4 Nights! Never Ordinary With Advance Savings : 20% Saving on Stays of 4 Nights!! Per AQUUM trendsetters are once again ahead of the curve. Those who know what they want and can book 45 days in advance enjoy a 20% saving on stays of 4 nights or more. Renowned for its trailblazing concepts Huvafen Fushi is one of the Maldives most iconic properties and is Per AQUUM�s original retreat. The advance rates include daily breakfast and offer greater savings, providing you with more opportunity to explore the spa, design and cuisine of the property. Experience the naturally modern elements of the destination with a dinner under the stars, enjoy a tailored massage in the underwater treatment rooms at LIME Spa or spend a day by the pool with a good book. Promotion includes: 20% saving on stays of 4 nights or more. Daily breakfast in Celsius. Rates start from USD 832 per room per night. Book Now. Per AQUUM currently boasts three award-winning properties - two in the Maldives, Huvafen Fushi and NIYAMA, in addition to the management of Desert Palm in the Emirate of Dubai in the UAE. MHG and Universal will further invest in the brand over the coming years and the planned expansion will mirror MHG's current footprint across Asia, the Indian Ocean, the Middle East and Africa. Per AQUUM Retreats � Resorts � Residences is a specialist luxury retreat, resort, spa and residence management company that offers a different kind of company ethos: one that is passionate, visionary, imaginative and naturally modern. Each property embodies regional traditions and combines luxurious fittings and furnishings in a culturally sensitive way. No two properties are alike. Literally translated, Per AQUUM means 'through water', and the vision of the company is to develop and manage properties in desirable locations using naturally modern, ecologically responsible design.